Known For: I like to think that I was good for the game. I was proud of my playing achievements but I also feel like I helped the game grow through my tournament, book and as part of the Crokinole video. I tried to help other players improve their skills. I congratulate those who went on to capture championship status. For those who didn’t win, I tried to show courtesy and respect. Profession: Retired High School Teacher.. Style of Play: Offensive. As many 20’s as possible, but defensive if the situation demands it. Singles or Doubles: Singles. I am better at it and do not have to worry about letting down my partner. Crokinole Idol: Leo Gaessler. He made amazing shots that dazzled me when I first played in a tournament. Other hobbies: Exercising, horse races, baseball, reading. Favourite Shot: Going for 20’s was the best and favourite part of my game. I like the follow through shot plus any other shot that might dazzle the opponent and catch him a little off guard. Joe was introduced to Crokinole at a very young age at his grandparents. Shortly after that his parents bought him a board of his own. Without knowing they it, Joe’s parents had just created the start of a crokinole legend. 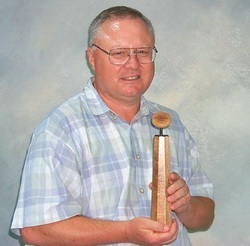 Before the World Crokinole Championships came along, Joe was travelling around Southwestern Ontario entering every crokinole tournament he could find and was winning the majority of them. When the WCC came into existence, nobody wanted to win more than Fulop. On his third attempt after placing 2nd and 3rd and already claiming two 20’s Titles, it was Joe’s turn to claim the title of the world’s best crokinole player. After his 2001 win, he went on to win 2 more championships before health issues slowed Joe’s championship run. Joe smiles at the recent victories of Jason and Ray Beierling, Brian Cook, Nathan Walsh, Fred and Justin Slater and hopes that he inspired them all in some way. Joe states that Brian Cook a tough croke to shake. With his wide array of shots that he uses to go for a victory, and his never give up, no mercy style, Brian has earned Joe’s respect. Joe also mentions Ray Beierling as a feared opponent, who has made himself into a singles champion. Ray and his brother Jason have dominated the doubles scene for several years. Currently Joe claims his goal is to get over his health problems as much as possible and be a decent player once again. Various other multiple tournament and club wins including Exeter, Hanover, Lambton, and Goderich. My book “It’s only crokinole: But I like it!”, although not particularly well written, helped other players to improve their games. Being part of the Crokinole video. Encouraging and helping other players. Being respected by other players. Thank you.